Shoot, Survive and be the ultimate FATHER!! 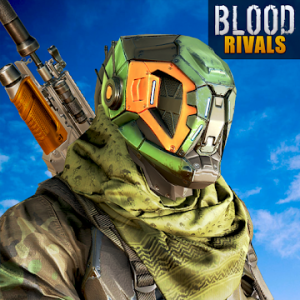 Blood Rivals is extreme survival shooter on the mobile. Land on the battleground of war, load up the gun, aim your target, and start shooting like ultimate hitman commando. Compete against many rivalry players with 3 chances on the frontline of the action battlefields. Kill the most and survive till end to become THE FATHER. Follow the rules of survival and all your specialized tactics to build up the best action multiplayer strategy game of the year. Drive speedy vehicles to explore the vast map, equip weapons, collect explosives and supplies. Defeat every player and become ultimate FATHER by surviving in the shrinking play zone of the exciting war games. Enjoy the endless FPS action of Blood Rivals. Play the best FPS multiplayer combat here. ● Realistic gameplay with rich detail creating eye opening visual experience. ● Feel like you’re in the thick of the action battleground as you play with high-quality audio and exclusive gunfire sound. ● Fully Customizable UI with best First person shooter experience in one of the top action games. ● Modern controls with unbelieveable 3D graphics, devastating battleground and spectacular locations of the top gun games. ● Engrossing unique experience on mobile with availability in both online and offline mode, like the most top free shooting games. ● Blood Rivals is designed with perfect shot system and incredible offers and bonuses of the free action games. ● Rush into flaunting high speed trains and escape off to safe zone of FPS shooting games. ● Commandeer a variety of vehicles like trucks, cars to hunt down your rivals. ● Make a swift escape to survive from devastating tornado storm and firing turrets of shooting games. ● Boost yourself with power raiser including high jump, dynamic weaponry, acoustic armor and enemy detector. ● Call of duty to race against time, exploding barrels, cars on the war battlefield of Blood Rivals. ● Load up on modern weaponry like Sniper rifles, shotguns, machine guns or pistols gives each player a distinct experience in battleground survival games. ● Challenge your friends around the world into best FPS games combat. ● Unlike all the top free gun games, get amaze by the highly advance aiming skills of the action games. ● Defeat intruders in Team Death-match mode up to 12 multiplayer opponents in modern gun games. ● Create your private room and team up with your friends worldwide in free battleground shooting game. ● Command your friends to victory and be the FATHER with exciting rewards of Blood Rivals. ● Build your army defense on battlefield for survival and battle against global players worldwide. ● The more you win, the better you play – upgrade and engage in harder, faster challenges that will send you flying up on the leader board! The real action of the year, fall into this innovative new game and break the standards of common battleground survival shooting games. It is full of action adventure on the hopeless land for modern warfare of critical strike. Either you are true fan of gun games, survival games, or fighting to be a hitman in the arena mode, then this is one of the epic Battle Royale Games. It is free FPS action multiplayer shooting games that you don’t want to miss.